"My stories were true. They involved living people, and they involved myself. They involved whatever I knew. I never lied to my readers." "I saw my villains not as villains. I knew villains had to come from somewhere and they came from people. My villains were people that developed problems." "Y'know, for comics to be effective they have to mirror life in some way. You've got to make them high drama. You gotta make them - not fictional, but you've got to dramatize, like what you see in Captain America." "If you analyze them, you'll find that I'm not really fictionalizing. There's a realistic ending, there are realistic circumstances, there are realistic beginnings and consequences"
"...Reed and Sue's casual clothes on page 2 and the Thing's sweater on page 8, and Sue taking the baby from Crystal on page 2. These seemingly minor details make the FF seem like real people, and were a big part of the sense of family fans felt reading the comics of the Lee/Kirby era. The very lack of this type of storytelling detail is one of the reasons the FF has never reached the heights it attained while Kirby was on it." - John Morrow, introduction to "Fantastic Four: the Lost Adventure"
"What Kirby offered to me as a reader was both his tremendous visual imagination and his ability to integrate incredible super heroics into the most quotidian of urban settings. 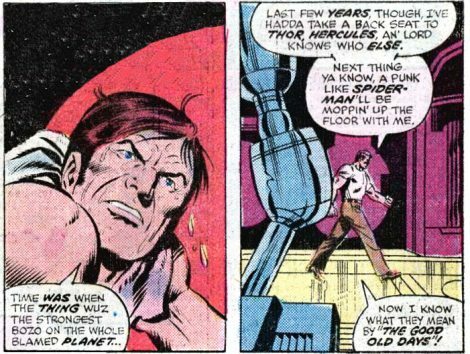 [...] Favorite moments include Thor climbing into a taxi cab and chatting with the driver, and Jack spending a half page showing normal folk on the street cops, kids, etc.—reacting to Galactus on top of the Baxter Building. His world was very much our world, and his superheroes were very much a part of it." "I prefer conflicts that are based on reality rather than based on fantasy. When you get wound up with super villains, super fantastic gadgets and super incredible action, everything has to be made so deliberately that it all becomes senseless." "Comic book historian, Greg Theakston has theorized that Ditko saw Spider-Man as a semi-autobiographical piece, and that Ditko had personal ties to the character. In fact, one can draw a great deal of similarities between Ditko and Peter Parker. Ditko was a shy and mild-mannered student, who wore glasses and was very smart. He was not the most popular student in school, and often kept to himself— sound familiar? According to Theakston, whenever Stan tried to inject any changes into the strip or change the direction of the stories, Ditko felt slighted, crushed. This was in a round about way, about him— his views, his feelings. Ditko was not going to be told how to handle a character he created and molded after his own life and views." "It was important that Lee's heroes lived in the real world, and not in Gotham City or Metropolis, because they were real people. That is, Marvel Comics imagined how real people might act if they suddenly gained superpowers -- confused, conflicted and not necessarily eager for the responsibility. They were a departure from that straight-arrow hero of the Golden Age, Superman. The next age belonged to Marvel. And Stan Lee ushered it in with his creations." "When Lee's heroes are not defending the earth from weird menaces, however, they lead lives much like other New Yorkers (Lee's stories were set in the real world, not fictional cities such as Metropolis). They have trouble hailing cabs, get razzed by teenage toughs, chat with the mailman, and even lose money on the stock market--and young Peter Parker has to juggle typical teen problems with fighting super villains"
"Comic book super beings had mighty powers but no personality—not until Stan Lee tried out the Fantastic Four in October, 1961. The whole new tone of Lee's vision to bring human reality into comic books was set in an early F.F. appearance. (All Marvel characters quickly pick up affectionate nicknames.) This super crime-fighting team was evicted from their Manhattan skyscraper HQ because they couldn't get up the rent. The stock market investments that paid their laboratory bills had temporarily failed. The Fantastic Four, who appear in their own comic book and guest star in other Marvel publications, are beset as much by interpersonal conflicts as by super villains." "..as if they were happening in the same world inhabited by the readers. 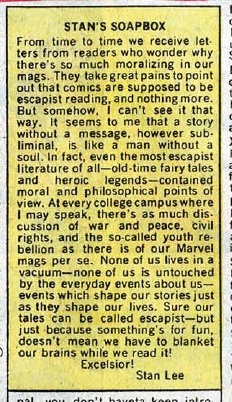 This is underlined by Lee and Kirby's introduction of the real world into their fantasies. In #9 the F4 go to Hollywood and the issue features guest spots from, among other, Dean Martin, Bing Crosby and Bob Hope. The dialog is peppered with contemporary references and Kirby and Lee themselves turn up..."
The world's greatest classics feature superheroes. The Bible has angels who fly and have supernatural powers, and of course Samson! Shakespeare has his ghosts, magic potions and even the occasional goddess (such as Hecate in Macbeth). Greek epics and myths had the original superheroes: Hercules, Hector, Achilles, and the gods. Superheroes were always part of the classics. Some of the greatest writers in history employ magical realism: realistic, down to earth stories that just happen to include utterly incredible elements as if they're perfectly normal. James Joyce, for example. And writers don't come much greater than Joyce. For more details, Google "magical realism." Superheroes, at certain times of history, are the most appropriate reflection of the real world. The world's ancient epics, for example, appeared at the start of the bronze age. Read the Iliad, placed around 1200BC. notice all the detailed description of armor. This is what made kings and the greatest warriors into superheroes: the elites had a new precious metal for their armor and swords: this new super-material allowed a single hero to defeat a dozen ordinary soldiers. Homer exaggerated their power and gave them miraculous divine help, but their story was a heightened version of what was happening in the real world: technology was creating superheroes. It is the same in the 20th century: just as bronze revolutionized the world, so did modern technology. Modern elite heroes could fly at faster than the speed of sound (in jets), fly into space (on rockets), destroy whole cities (nuclear weapons), shoot all kinds of energy bolts from their hands (guns have kinetic energy,and new weapons promised lasers). As with Homer, the comic book writers reacted to the new world, exaggerated it, and gave it a miraculous cause, as it was indeed a miracle. "It's a fundamental disconnect to think that a world with teleportation, undersea races, mutant nations, and gangs of superheroes would still have Paris Hilton as a celebrity focus. In fact, people living on a consistent Marvel Earth would have a culture almost unrecognizable to us: Instead of being the Crown of Creation, they'd be living with the knowledge that we're a not-very-evolved backwater planet with a sorry excuse for technology--and that immortal Gods exist and periodically tear things up. The supernatural would be a certainty, as would the afterlife--and America would have no sense of security at all, with giant robots marching through the countryside. If I were to actually craft a background that jibed with the Marvel Universe foreground, America would far more resemble Mughal India than our world of high cholesterol and YouTube." Most of the early Marvel heroes could be defeated by ordinary people. The Thing could not lift more than five tons (at first). The Human Torch could be defeated by a bucket of water, Spider-Man had to run from the police, and the Hulk was always running from the military. Any more powerful characters (Thor, the Watcher, the SuperSkrull etc.) spent most of their time on other worlds or otherwise unable (or unwilling) to interfere. There is no need for power inflation. If you know a man who can lift five tons, that's exciting! But if you know a man who can lift five thousand tons, it's impossible to relate and the story becomes dull. In the early days there were fewer than twenty superheroes. It was possible to believe that maybe they existed out there in the real world. But modern Marvel boasts of more than five thousand licensed characters. The real world connection has been lost. Nearly all the big events in early Marvel happen in secret. So you can believe that maybe they really did happen and the 1960s news cameras either missed it or hushed up (as they did with JFK's affairs). When the Sub-Mariner's giant sea monster crashed onto New York all the people had already been evacuated (FF 4) - all they saw were broken buildings and evidence of a freak tornado (created by the Torch at the end of the story). When the Sub-Mariner's Atlanteans invaded New York it took literally minutes, and all his people were forced back into the sea a few hours later without a single shot being fired (see FF annual 1, pages 20-25). This was in an era when people were more likely to accept the government's explanation for things, so to avoid panic they could easily have said that the Atlanteans moving down the main street were just a parade. When the Mole Man threatened to lower every major city into the earth, all he actually lowered were top secret nuclear plants or single street blocks. When Galactus almost ate the Earth, most people just saw strange weather events, and a giant on top of the Baxter Building, which the newspapers said was a publicity stunt. Dr Strange did cosmic things, saving the whole world, but using spells so that ordinary people are completely unaware. When the Skrulls invaded, only four aliens reached earth so nobody really noticed. Sure, the government noticed, but they hushed it up. One reader wrote and objected: "But what about the early Hulk?" he said. In issue 2, page 14, and issue 6, page 12, we see events that were known to the whole world (the toad men invasion and the Metal Master's global activities). But even this proves the point: the letters pages show that the readers wanted believability. This was the only early Marvel comic to be canceled due to poor sales. When the Hulk later came back he had smaller scale adventures, and sales soared! If Stan ever published something that was unrealistic he had the perfect solution: the No Prize. If you see anything that doesn't make sense you are invited to think of a clever explanation and then you get a (no) prize! Not only did it guarantee that all stories made sense, it increased the readers' connection with the stories, which is the whole point of realism! The superscience and Fantastic Four technology pages of this web site are in the spirit of the No Prize: You think that the comics don't make sense? Sure they do! Hey, Stan, I want my No Prize! The bottom line is that all the comics describe events that really happened. Realism is everything. Realism does not subtract from the fun, it adds to it. Realism is what made Marvel great. "But modern comics are more realistic"
Modern comics are grittier and have movie-like dialog. That does not make them more realistic. 1. With extreme violence, soon every hero would be either dead or crippled. 2. Anti-heroes (e.g. the modern Batman) are only sympathetic if they never make mistakes. Heroes who never make mistakes are unrealistic. Superpowers are dangerous. One wrong move and you're all dead. Where superpowers exist, wars become largely a matter of posturing, to intimidate but not to kill. We see this in the Cold War: nobody dared use nuclear weapons in anger, so the goal was to intimidate without escalating to mass death. So stylized super powered fights are more realistic than simple attempts to kill the enemy. We can learn from Shaka Zulu. Super beings are like the old Zulu tribes. Battles involve a lot of posturing and spear shaking, and warfare can continue for generations. But then Shaka Zulu came along, and he focused on more efficient killing. So he quickly defeats everyone and stability ended. For a stable costumed population you need to have wars based on proving your ability, not based on blood. As soon as a grim and gritty leader appears (like Shaka Zulu) then the game is over. So for superheroes to exist, the only realistic kind of battle is the flamboyant ritual fighting of the silver age, not the bloodletting of modern times. Many comics have cinema envy. They try to imitate Hollywood 's version of "realistic" dialog: very few words, and carefully chosen. But cinematic dialog is less realistic than compressed didactic dialog: superheroes are like the emergency services. In the real world, the emergency services have to communicate clearly: they use flat, explanatory dialog because ambiguity can mean death. When off duty people talk in a verbose fashion, and often state the obvious just to make conversation. Contrast this with the sparse dialog in modern comics, where it's hard for new readers to know what's going on. Cliche language:a character (especially a villain) would often speak in cliches. This enabled a reader to quickly understand the sense of what is going on. Communication is more important than verisimilitude. Saying a hundred words in a split second (e.g. "look out, a bullet is coming toward you!"). This simply translates the non-verbal communication and shared understanding that is lost in modern comics. Modern comics are also seduced by Hollywood glamor: characters inhabit a world that their readers do not. An early example of this is when DC de-powered Wonder Woman to make her more like Emma Peel. But her world of high fashion and money was no more realistic than her world of ancient gods. 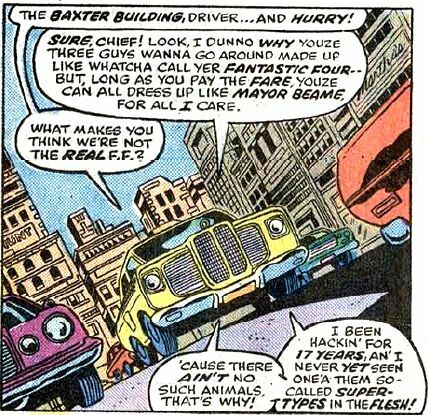 A Kirby street scene, full of ordinary people but only one amazing thing, is more realistic than a modern comic where everyone is wealthy and handsome. "I guess that’s part of the reason I stopped caring. It wasn’t just that every character seemed to get a new voice and personality and face and physique when handed from one creative team to the next, but often everything that came before was ignored, contradicted or written off as somehow not real. It’s at a point where I can no longer believe that these characters are the same people anymore and it’s to a point where I can’t get caught up in their adventures because I know that somewhere down the line, whatever had happened will be tossed out the window just as everything else had been countless times before. " The wimp's excuse "but it's just a comic"
Some people mumble apologetically "but it's just a comic." Shame on you! Demand more! The early comic writers and readers treated their comics seriously, and the result was better comics! Fantasy must make perfect sense within its own world. Why? Because the purpose of fantasy is to let us see our own world from a new perspective. This is why we need continuity. By making one part unbelievable we make it whole thing unbelievable and thus pointless. And this is why it is dangerous to be too stylish: it is not our world. We cannot relate. Suspension of disbelief: what does it mean? Notice that last part? Suspension of disbelief is a form of faith. Faith means you trust that something is real, even though you don't analyze it. To suspend something (in this context) means to make it wait. The answers will be forthcoming, but not yet. Coleridge was talking about his poem the Rhyme of the Ancient Mariner, because it refers to spirits. Coleridge believed that spirits were real, and he was asking his audience to just accept it for now, because they could discuss the details later. "[...] make imaginary puissance [...] 'tis your thoughts that now must deck our kings [...] turning th'accomplishment of many years into an hourglass." Notice his explanation: he's reporting the acts of real kings, and merely compressing the events in time. It's the same explanation as used in the Thing story: these are real events, and any problems are due to editors who have to fit the constraints of the medium. In modern times, "suspension of disbelief" has been twisted to mean "we don't care about this part." But this just causes more problems. If you don't care about one part (e.g. Superman's disguise) why do you care about other parts (e.g. he can fly)? If you chose to accept one part as nonsense then you pretty soon have to accept everything as nonsense. Tolkien explained the whole purpose of marvels (he was not referring to comics, but this applies to all fantasy). Marvels exist for us to marvel at: to make our minds expand and race, not to shut them down. "since the fairy-story deals with 'marvels,' it cannot tolerate any frame or machinery suggesting that the whole framework in which they occur is a figment or illusion." Remember that quote from Kirby? "My stories were true. They involved living people, and they involved myself. ... If you analyze them, you'll find that I'm not really fictionalizing. There's a realistic ending, there are realistic circumstances, there are realistic beginnings and consequences"
"Interviewer: Like SPIDER-MAN really is real?! "DeFalco: Aren’t they all! And Alan, as he often does, just nailed it. Q: Is there any chance of a more mature Spider-Man book coming out? Spider-man's schtick is that he is a very relatable character. It would be nice to see him in the most realistic as possible. A: In the most realistic manner possible, Spider-Man would be dead of leukemia. Buy the same logic, Spider-Man would not be Spider-man, so Brevoort's logic is flawed. Spider-Man's form of radiation was clearly not conventional. Q: Which comic universe do you think is more possible to be real in this world? Like which universe can work in our world? Marvel or DC? A: I don't think any comic book universe is particularly close to reality--that's why all of this stuff is fantasy. of the two, marvel is on the whole closer to the real world, I think, but that doesn't mean that our books are completely realistic. As it turns out, men can't fly in the real world. Men can't fly? Don't tell that to Yves Rossy, the Swiss jet man. Comics merely suggest the discovery of more compressed alien energy sources. It's not a huge leap of the imagination. Q: "Why not have some villains subjected to hardball consequences?" A: "Because we're not working in the real world, and next month we're going to need villains for our heroes to fight as well, so it's not a good idea to kill off a bunch of those characters. This is fiction, it doesn't always have to reflect reality that closely." You can't kill off villains? Marvel claims five thousand characters. Clearly it isn't that hard to make new ones if you lose a few. Is realism so unimportant? Pete Woodhouse: "The splash page is very reminiscent of Marvel (members of the public reacting astonished to hero-in-their-midst is very early Marvel)[. ...is this] a conscious effort by DC?" Brian Cronin: "I would say it was definitely conscious." Many other characters have secret identities. These would be impossible to maintain in the real world, nor would Marvel comics know what they did. They also have colorful costumes. As the movies have shown, the most colorful costumes do not work in the real world. 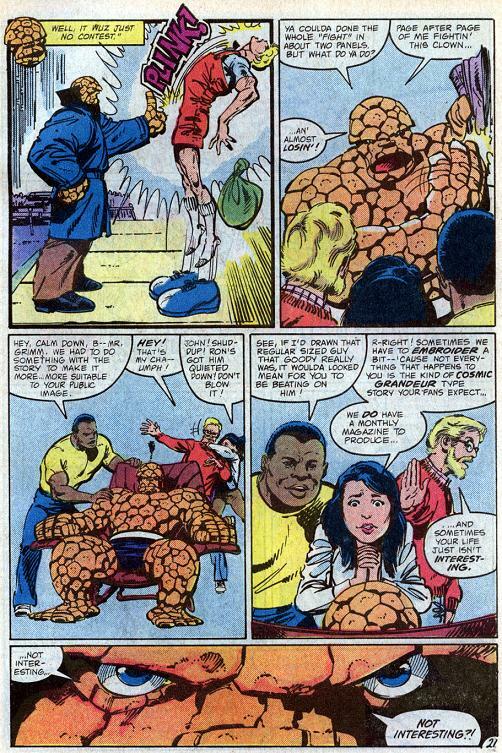 Within the stories, the FF report their activities to Marvel and other characters do not. So within the stories themselves, the Fantastic Four is more or less accurate, but other comics are largely made up. Especially where secret identities are concerned! Other comics break the rules of realism. 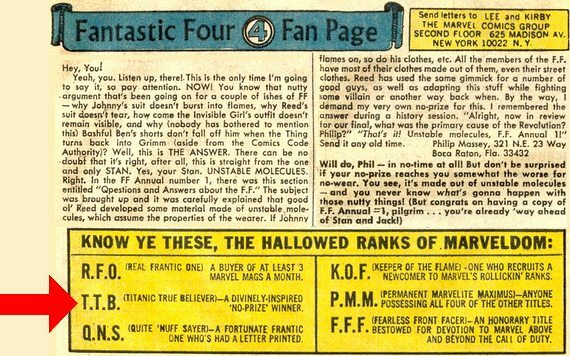 The FF has plausible deniability up until issue 321. (After that Franklin panics and starts to twist realities, and one year later it's all over). 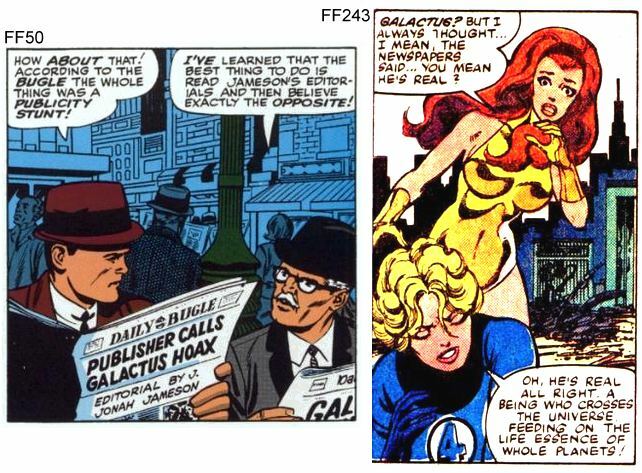 Look closely at the stories:, when Galactus first appeared, the ordinary people only saw him from a distance and the Daily Bugle reported it as a hoax; when the Skrulls invaded in issue 2 only the police knew; and so on. In contrast, other comics break the realism rule almost from the start. For example, an early copy of the Avengers featured the entire eastern seaboard of the United States being flooded. I think we would have noticed. The large number of characters in the Marvel Universe makes superheroes impossible in the real world. The simplest way to reduce the numbers is to say that only the Fantastic Four is always canon and other comics are often exaggerated. Many of the FF stories would be impossible if there were plenty of other superheroes to call on in an emergency: there would never be any danger, just keep the right hero on speed dial. The stories tell us so. In FF176 we learn that a can driver can drive around New York for 17 years and never see or hear of a real superhero. 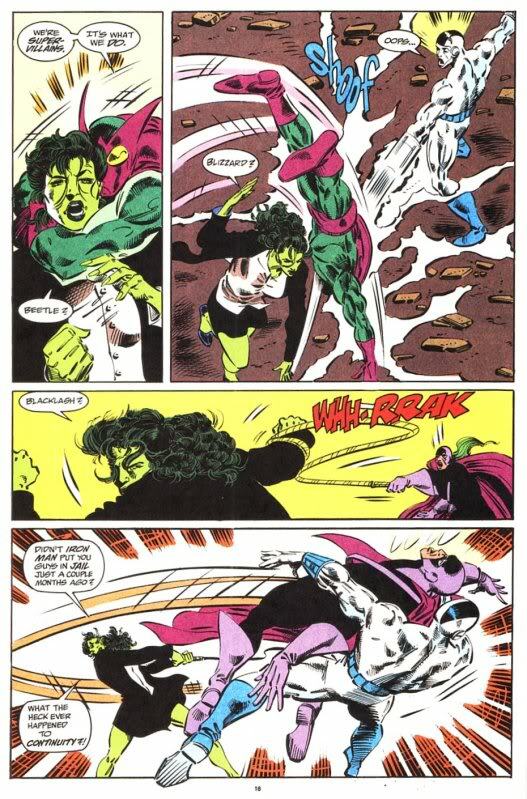 In She-Hulk's own comics we learn that in reality the other "super" characters do exist, but they are far weaker than they appear in most comics, just as we saw in The Thing issue 7. There is another explanation for all the impossible stories: Mystic Marvel. Every Marvel title has a half hidden undercurrent of magic. In some it is explicit (Dr Strange, Excalibur, etc.). In others it is more subtle (the community of Salem in the Fantastic Four, or the Juggernaut and Cyttorak in the X-Men). Nathan Adler, in his Fanfix blog, argues that mystic forces are central to the X-Men, and mutants are not what they appear to be. The Dr Strange comic describes titanic secret battles with higher beings who wish to remain largely hidden. So these are the real story of Marvel and the superheroes are merely the surface. The mystic forces could have their own reasons for keeping the world as it is, and that is enough to explain anything odd in Marvel Comics. This is a huge conspiracy theory, but there is evidence for it everywhere. It would take years to develop this coherent theory of magical realism in the wider Marvel Universe, so I won't even begin to try. For convenience I apply Occam's razor and just say other comics as less canonical than the Fantastic Four, but I acknowledge that this is not the only possible view. The strength of Marvel in the 1960s was the same as the strength of all great fantasy drama: incredible exploits and down-to-earth realism. The more incredible and more real you can fit into a comic, the better it is. And those early Marvels were pretty darn good.